General “Hap” Arnold admitted it. Women can fly as well as men. With a severe shortage of pilots in 1942, the United States turned to an experimental program to help fill the void: Train women to fly military aircraft so male pilots could be released for combat duty overseas. There was no military plane not flown by women during World War II. Over 1,100 women, all civilian volunteers, flew as part of the WASP program. They ferried new planes long distances from factories to military bases and departure points around the country. They tested overhauled planes. They towed targets for training ground and air gunners, who shot with live ammunition. Pioneering aviator Jacqueline Cochran headed the WASP program. She believed the program would be militarized if it was successful. It was. The women’s safety records were comparable and sometimes even better than male pilots doing the same jobs. WASP (from left) Frances Green, Margaret Kirchner, Ann Waldner and Blanche Osborn leave their B-17, called Pistol Packin' Mama, during ferry training at Lockbourne Army Air Force base in Ohio. They're carrying their parachutes. At first, the suggestion was made to militarize the WASPs into the Women’s Army Corps. Only one female colonel was allowed, however, and that was Col. Oveta Culp Hobby. Cochran refused to serve under her. By 1944, the Allies had achieved air superiority in Europe, and pilots were coming home. They were eligible for the draft, and wanted to keep flying. No longer were women needed to release the men for combat. The men wanted to get rid of the women. Cochran told Arnold to give her charge of a militarized WASP program or disband it. Arnold wasn’t willing to fight her battles anymore; he had a war to win. The WASPs were disbanded. The women had no benefits, no gold stars for their parents’ windows if they died. And 38 women did die in service. And because they were civilians, the military didn’t pay for their remains to be shipped home. The women took up a collection for that. That upset former WASPs. It wasn't true. They had been the first to fly military planes. 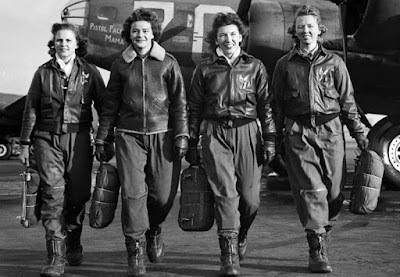 Finally, in 1977, the WASP were granted military status. Nice post! I learned about the WASPs several years ago, and someday I'd love to get to their museum in TX.